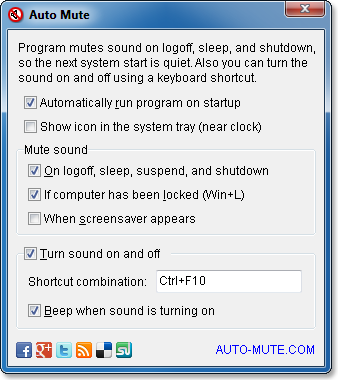 Auto Mute 4.5 Free Download - Small software utility to make PC silent when it is turning on or is waking up. Small software utility to make PC silent when it is turning on or is waking up. Has your child ever been awakened with the loud &quot;Ta-Dam!&quot; sound your laptop played when you opened it at late evening? Did you ever open notebook on conference and the computer loudly notifies you about new messages or something? I bet, you wanted to smash the computer into smithereens then. Each time this happens to me, I promise myself to disable the sound before logging off, but I always forget about this in few minutes. So I've created small software utility to make PC silent when it's turning on or is waking up. Solution is very easy! The sound is automatically muted when the computer is turning off or is going to suspend mode. The next system start is absolutely silent even if you forgot to turn the sound off in previous session. After that you can enable sound effects manually, using a shortcut combination. Moreover, you may use this keyboard shortcut to quickly switch the sound on and off. Statement: First, please download the orginal installation package by clicking the download link. Of course you may also download it from the publisher's website. Using Auto Mute crack, key, patch, serial number, registration code, keygen is illegal. The download file hosted at publisher website. We do not provide any download link points to Rapidshare, Hotfile, Depositfiles, Mediafire, Filefactory, etc. or obtained from file sharing programs such as Limewire, Kazaa, Imesh, Ares, BearShare, BitTorrent, WinMX etc. Software piracy is theft. If you like Auto Mute please buy it.